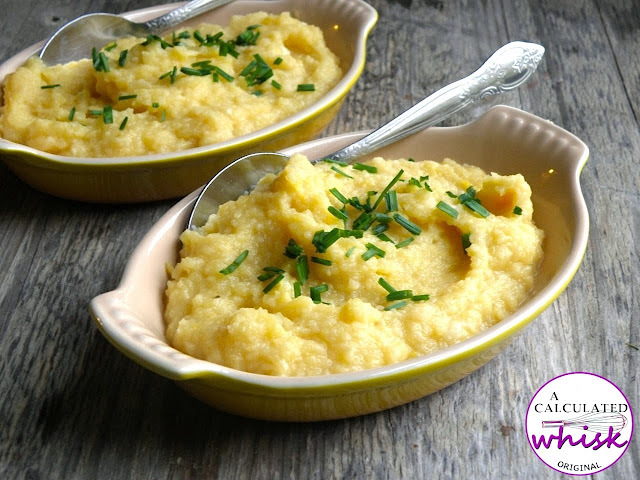 Mashed rutabaga and squash with roasted garlic is a paleo and vegan side dish that’s comforting and packed with flavor. Have you ever tried rutabagas? They’re also called yellow turnips, and they make an amazing low-carb replacement for mashed potatoes. I was initially inspired to try them after seeing Ina Garten’s recipe for mashed rutabaga with crispy shallots, and I like to serve them with bacon-wrapped shrimp. I once asked Ben what his favorite dish that I’d ever made was, and he told me he’s always happy when I make mashed rutabaga. Since I’m working on Thanksgiving sides this week, I wanted to put a fall spin on things. Here I’ve added winter squash, as well as a generous amount of roasted garlic. The combination of mashed rutabaga and squash is fabulous. Don’t be scared by the fact that this recipe calls for a whole head of garlic–once the cloves are roasted, they’re soft, mellow, and almost nutty. 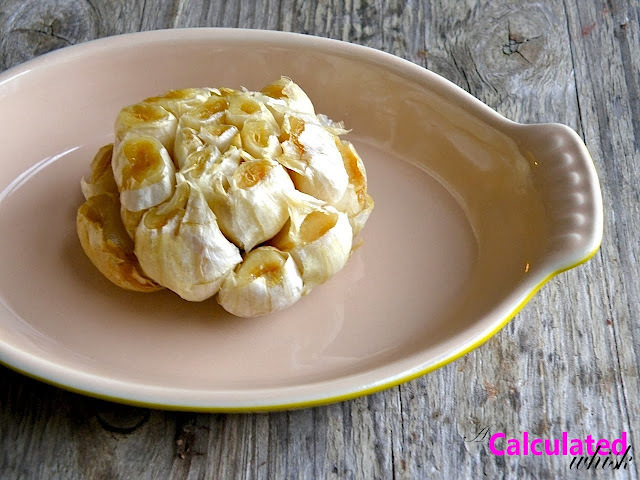 If you haven’t roasted garlic before, you have to try it. It’s really nothing like its pungent, raw self. If you need more reasons to try it, consider this: garlic has lots of antioxidants, and you won’t have to worry about running into any vampires. I also wanted to make this a vegan side, so I used olive oil and coconut milk instead of butter and cream. Somehow, the finished product still tasted really buttery and creamy to me–I think it’s part of the magic of roasted garlic. 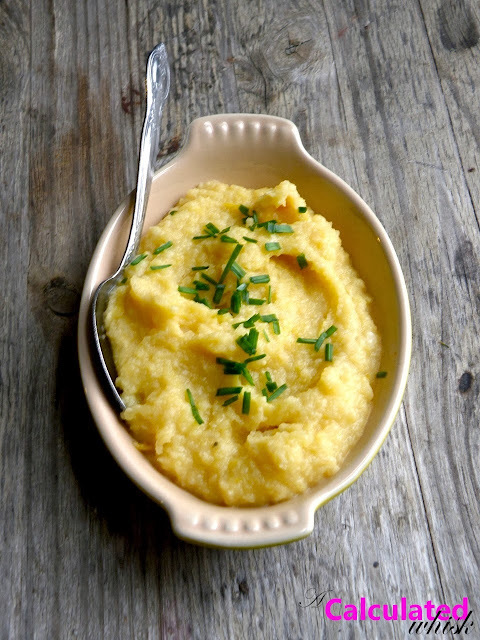 I hope you give this mashed rutabaga and squash recipe a try! Mashed rutabaga and squash with roasted garlic is a paleo and vegan side dish that's comforting and packed with flavor. Preheat the oven to 400°F. Remove the outer skins from the head of garlic, leaving the skin on the individual cloves. Slice off the top so that the upper part of each clove is exposed. Drizzle a little olive oil over the cut part of the cloves, and wrap the head of garlic in tinfoil. Brush a little olive oil on the insides of the cut squash. Place the wrapped garlic and the squash, cut side up, in a baking dish lined with parchment or tinfoil. Bake for 45-60 minutes, or until the squash is tender when pierced with a fork and the garlic cloves are soft when squeezed. Set aside to cool. While the squash and garlic are roasting, place the cubed rutabaga in a saucepan with water to cover. Bring to a boil and simmer, covered, for 30-40 minutes or until tender when pierced with a fork. Drain and place in the bowl of your food processor. When the garlic is cool enough to handle, squeeze out the cloves and add them to the food processor with the rutabaga. Scoop out the squash flesh and add that, too. Add two teaspoons of olive oil and a little salt and pepper, and pulse to combine. Add the coconut milk a little bit at a time, just until the mixture is smooth. Taste and adjust seasonings. If necessary, transfer the mixture to the saucepan and reheat it on low, stirring constantly. Serve hot, with chives on top if desired.